Accurate and stable incoming and outgoing longwave radiation measurements. 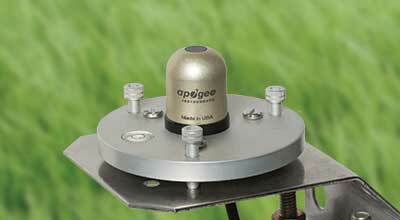 Apogee Instruments' thermopile pyrgeometers are accurate, stable, durable, and cost effective. Calibration in controlled laboratory conditions is traceable to the World Infrared Standard Group in Davos, Switzerland. Long-term non-stability determined from multiple replicate pyrgeometers in accelerated aging tests and field conditions is less than 2 % per year. The patented domed shaped sensor head for the upward-looking model facilitates runoff of dew and rain to keep sensor clean and minimize errors caused by dust blocking the radiation path. Sensors are housed in a rugged anodized aluminum body and electronics are fully potted. A thermally-insulated base is included to be mounted between the sensor and leveling plate. The AL-120 Solar Mounting Bracket with Leveling Plate facilitates mounting the sensor to a mast or pipe. The AL-100 Solar Sensor Leveling Plate is designed to level the sensor while sitting on a flat surface or mounting to a surface. Designed to optimize performance and price. The filter, blackbody thermopile detector, and thermistor (to measure detector temperature) are all contained in a compact housing that provides improved thermal coupling. A 0.2 W heater keeps water (liquid and frozen) off the sensor and minimizes errors caused by dew, frost, rain, and snow blocking the radiation path. Applications include longwave radiation measurement in agricultural, ecological, and hydrological weather networks and renewable energy applications.